The flying star has number 8 sitting in the middle so this is VERY auspicious for most of us - it sets the tone for the year; money money money. If you have a rabbit or a sheep in a beneficial place in your chart then the year of the pig will be very welcome most particularly if you need wood and water. If you are a snake, or it is placed in an important palace, and you need earth or metal then you will find challenges this year. These are years to stay still, take stock and prepare for the good years. We cannot always reap, we must sometime store the seed we have harvested previously. For a deeper analysis of the annual energies book in for the one off annual seminar, or read the more in-depth blog article. There will be only one annual seminar in 2019. You can book in for the seminar or for a one on one follow up - again I urge you to book in early so I can get your documentation ready. January is very busy for me as I will also be teaching Tai Chi 3 days a week through summer. See below for the Tai Chi schedule. Additionally, my husband is having scheduled surgery late February so that also impacts my availability for one on one follow ups. At this stage, given that I have made 7 attempts to do the annual calendar, I will not be able to provide it in time for personal follow ups and possibly, unless the hex lifts it will not be a feature for 2019 - you have to sometimes just go with what the universe dictates!!!! I have, as usual, analysed in greater depth the energies for 2019 based on previous experiences 60 years ago and famous people who were born in the year of the earth pig. I chose 2 to examine in greater depth. You will also get more info at the annual seminar. We will have 8 in the middle, 9 flies to the north west palace, 1 flies to the west palace, 5 flies to the south west palace, 3 flies to the south palace, 7 to the south east palace, 6 to the east palace 2 to the north east palace and 4 to the north palace. If you want to sell property then activate the 4 in the North Palace. Planning and wealth creation activate the 8 and the 9. Health and wellbeing we look to moderating the influence of the 5, 7 and 2 and to avoid legal difficulties we act upon the 3. 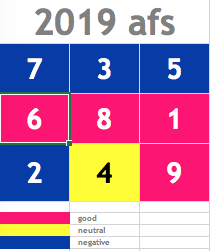 Every year I break down the annual energies to determine what the theme is for us all - kind of universal invitation for 2019.